Description: monthly_special_3 - The monthly special 3 is a colored marble sphere that can act as any one of these decorative marble balls that suits your particular fancy. 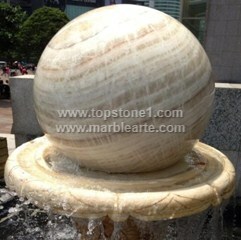 As one of the best sphere fountains around, this water feature ball would make an awesome marble sphere water feature, spinning ball fountain, water sphere fountain, rolling marble fountain or a simple fountain ball. Don’t be fooled by the simplicity of this fountain ball. Though it may not seem like one of the best marble versions of a spinning ball fountain or a water sphere fountain, this fountain ball is one of those sphere fountains that would blend your entire room together. So don’t miss out on buying one of these sphere fountains for your own little niche and see the difference even simple sphere fountains can make.